Welcome to the November 2018 edition of the Jack Russell Gallery Newsletter. We hope you enjoy reading about what we've been up to. I still can't believe it's 30 years this year since my first ever professional exhibition. 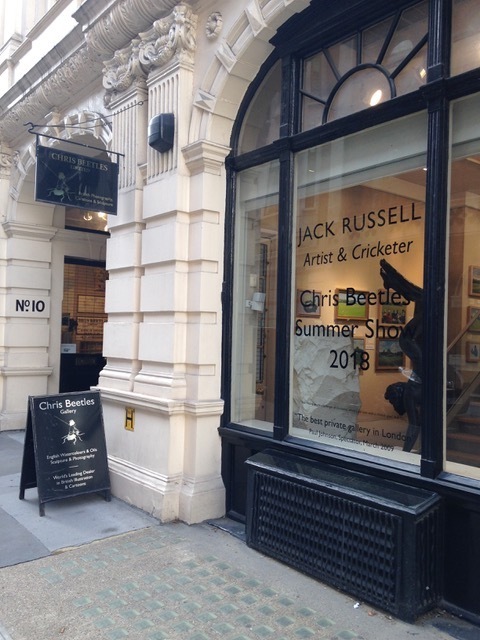 To celebrate, Chris Beetles Gallery in the centre of London held a 3-week exhibition of cricket paintings, including many of my latest works. Thanks to Chris's team and everyone who came to view, it was a great success. Jeffrey Archer introduced Lord McLaurin who opened the exhibition with some fascinating stories which I still deny! Even though they are true. It was quite ironic that we had my old hat on display, locked in a cabinet for safety. Not so much to stop it being stolen but it's in such a bad state that we had to stop people catching anything from it on “Health & Safety” grounds! We all had a good laugh on the opening evening as it was the hat that Lord McLaurin banned at the end of my England career! I have to put on record that Chris Beetles and his team have treated me absolutely first class. I know from experience and from other artists that that is not always the case with galleries. So a big thank you Chris. 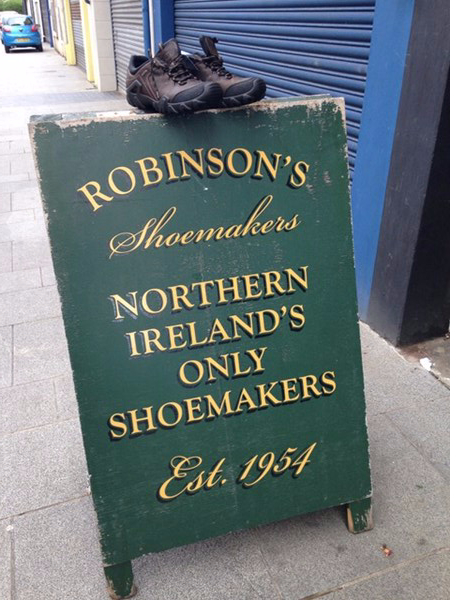 Top man! Chris exhibits a wide variety of work so please check out his gallery at www.chrisbeetles.com. I have to say I also fell in love with the work of Albert Goodwin, and I'm not really a watercolour man. Amazing! 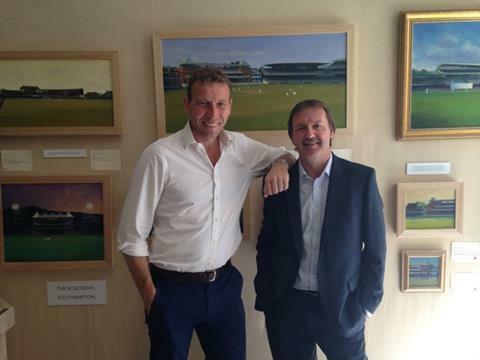 During the exhibition I caught up with my old Captain, Mike Atherton who did us proud with a nice piece in The Times on 9th August. Also thank you to Huw Turbervill and James Coyne of The Cricketer Magazine for a lovely piece in their August issue thecricketer.com. 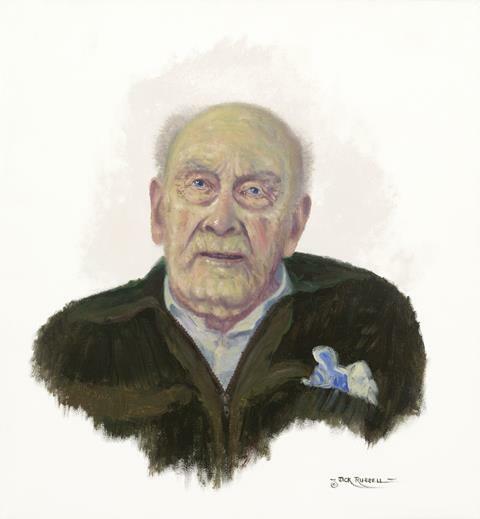 The exhibition showed my latest Lord's painting, A Lord's Summer, which we are launching with this newsletter as a new limited edition giclee of just 100. Because of the likely demand we will have to sell them on a first come first serve basis and will be available from 7th December - price £250 plus £15 p&p. The first person to do so will get “Number One” from the edition. In August I had a delightful trip to Carrickfergus Cricket Club near Belfast to paint a picture for the club to mark their 150th Anniversary. Thank you Michael Boyd in America for commissioning the painting and a big thank you to Robin Stewart from Robinsons Shoes who looked after me brilliantly during my stay. I even picked up a much needed new pair of shoes! 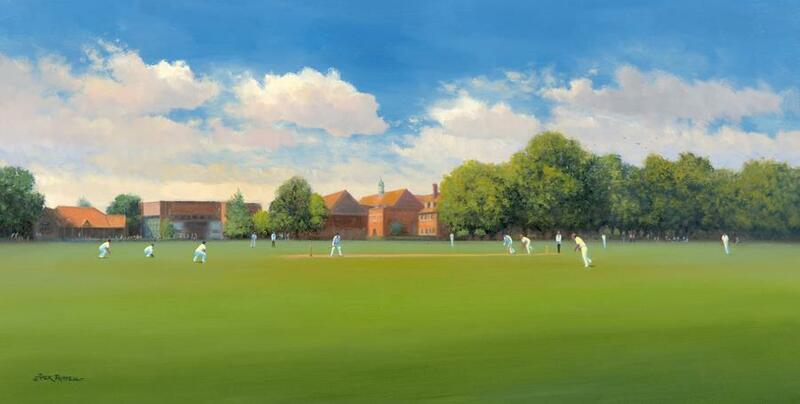 Thank you Sue Thomas for asking me to paint Dauntsey's School in Wiltshire during the hot Summer. Her son Will was playing against his father Nigel in the school team against Old Dauntseians for the last time. Also thank you to Head Master Mark Lascelles for helping with the deception so that Nigel was kept from the surprise, even though I spent several hours wandering around the boundary making sketches and taking photographs in full view of the players. It proves that he was indeed concentrating hard on the job standing at first slip! Will did in fact bowl his father out during the old boys innings but I couldn't be so cruel as to paint that moment so decided to go for Will batting instead. It is a beautiful school to paint and it was good to catch up again with ex Hampshire bowler Jon Ayling who is the Master of Cricket at Dauntsey's. 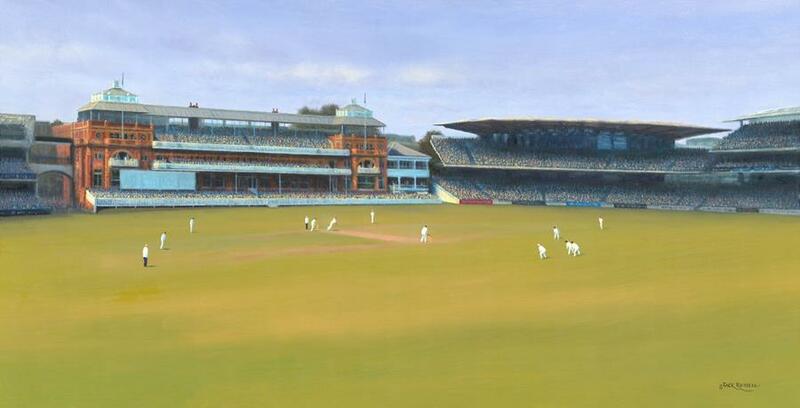 The Oval's 100th Test Match painting finds the perfect home, The Oval! 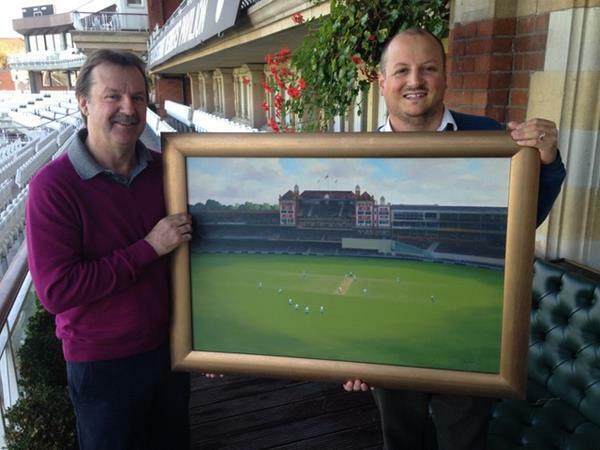 Jon Surtees accepts the painting on behalf of Surrey County Cricket Club. This year marks the end of the First World War. 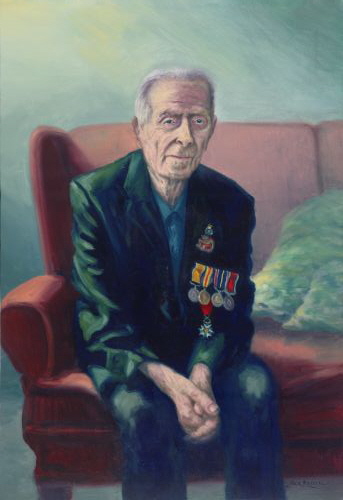 I was lucky enough to paint some of the last surviving veterans before they left us for ever. I'll always remember that time fondly. It was an honour and privilege to meet them. There isn't a chance in hell we won't remember them!!! It was a joy to meet everyone at Ronald McDonald House in Birmingham recently. 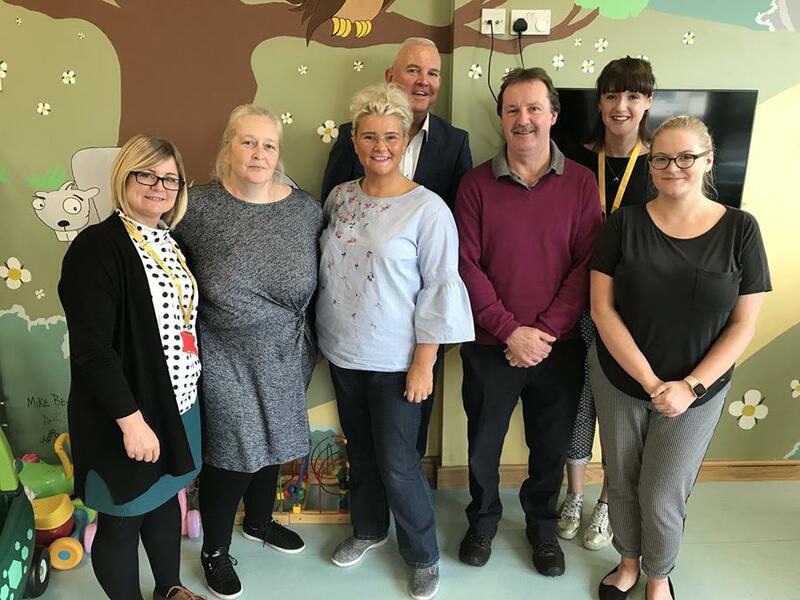 They do an amazing job looking after the families of very poorly youngsters at the Birmingham Childrens Hospital who are hospitalised miles from home. The families and siblings stay in Ronald McDonald House while the children receive treatment. To say the people there do an amazing job is the biggest understatement of all time. Please take 5 minutes read about it here and you'll see why they moved me so much. You can also visit their website for more information about their great work. This all came about because a guy came into the gallery called Doug Wright. If you google Doug Wright McDonald you'll see what an exceptional person Doug is. What an attitude to life!!! I know I say this every year but it's true and I'm going to say it again, without your support this artist wouldn't be an artist, so thank you to every single person that has bought a picture or book this year. You're amazing!!! Have a wonderful Christmas and a brilliant 2019. You are receiving this email as a Jack Russell Gallery newsletter subscriber.